Arrive at Bali International Airport where our representative will meet and greet with our guide who will transfer you to hotel. Rest of the day is leisure. 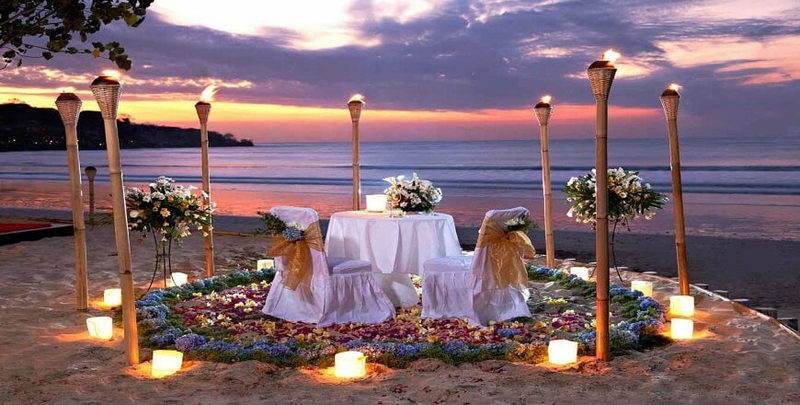 In Night have Romantic Dinner at Jimbaran Beach, overnight stay at hotel. After breakfast at hotel visit KINTAMANI, featuring Mt. Batur (an active volcano and Lake Batur). The spectacular view and fresh atmosphere dominate its beauty. Next is Tampaksiring, the temple of TIRTA EMPUL which was built over than 1000 years ago. You can feel the Holi spring around the temple. Next visit to UBUD palace and have lunch at Indian Resturant. Next have Dinner at Cruise and back to hotel, overnight stay at hotel. After breakfast at the hotel visit to the Tanjung Benoa area for the water sport activities, Later have Lunch at Indian Restaurant also you will get 2 hours SPA package. Next visit to ULUWATU Temple located on the southern tip of the peninsula, the ancient temple of Pura Luhur Uluwatu perched precariously by the sea is populated by a friendly tribe of protected monkeys Tribe. This temple stands on a hundred meters of a high cliff overlooking the Indian Ocean. Have dinner at India Restaurant, overnight stay at hotel. After breakfast at hotel go for the full day BALI FUN SHIP Tour. In return have Dinner at India Restaurant and back to hotel for overnight stay. Have breakfast at the hotel. Half of the day is leisure. After Lunch at Indian Restaurant go for MENGWI featuring Taman Ayun Temple the Royal Mengwi Dynasty Temple. Next Visit is TANAH LOT, an off sea shore temple builds in the small promontory. The wave Crash Sound believe could bring us a certain inspiration. You may take a picture of the beautiful sunset if the weather is clear. Have dinner at India Restaurant, overnight stay at hotel. After breakfast at the hotel it’s time to go back with good memories. You will be transfer to the airport. AC Transport + Driver during transfers & tours as per program.